Given the fact that you’re tuned into the Single Wives Clubs, I think it safe to assume that you have some Boss Babe ambitions. Like many of us following this community, you’re a hustler, a go-getter, you’re hungry for success. You are ready to be your own boss (psst…great place to start is at Werk Pray Slay). I too was at that point in my life some four years ago when I took a leap of faith and started an online boutique. Guess what; it failed! That’s right, my first business venture failed. Growing up I always had the entrepreneur mindset. I dreamt of having several businesses and great success. It wasn’t until after working a corporate job for about two years that I decided to put my money where my mouth was. You know, don’t talk about it, be about it! With a new-found determination to make my dreams come true, I opened a credit card, applied for my business license, ordered inventory, and signed up for my website and social media accounts. I was on my way, or so I thought. After a few months of promotions and sending free items to “Instagram Models,” I had a few sales here and there but nothing relatively close to breaking even. My costs were incurring and my sales and profits were only visible in my imagination. This went on for a few years before I pulled the plug and decided to go back to the drawing board. I finally took a much-needed step back and asked myself, “what did/am I doing wrong?” Once I asked that question, the answers hit me like a ton of bricks. 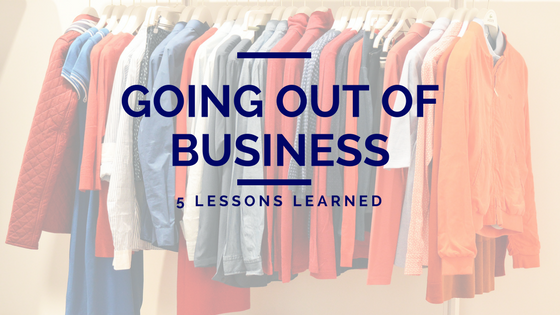 Here are 5 lessons I learned when my first business failed. Market Research: I had not done proper market research. By no means, am I a fashionista, nor do I keep up with latest trends. I started an online clothing boutique but never took the time to understand what people wanted or determine my niche. I never took the time to understand my competitors or heck even the retail industry. When deciding to boss up in whatever industry it is; DO YOUR RESEARCH! Passion and Purpose: I committed the ultimate entrepreneurial sin; I started a business in something that I honestly could care less about. An online boutique was not my passion nor what I deemed my purpose. I made the decision to open an online boutique because I thought it would be easy and fast money. How hard could it be to sell and ship clothes right?! Tuh, the joke was all on me. Being an entrepreneur is not for the faint-hearted. I strongly suggest going into business for something that you care about, that way when the work gets tough, you’re willing to do the dirty work. Network: It is extremely important to align yourself with people who are in the same industry and business as you are in or trying to be in. Learn from my mistake and do not see similar businesses and entrepreneurs as your competition. See them as opportunities and networking connections. People love to talk about their success and I’m sure you would love to be successful, right? Who better to learn from than someone who is in the same business and is successful? Do not be afraid to get out there and ask for advice. Market Yourself: You, my dear friend, are an extension of your business and are a walking advertisement. Consumers are much more willing to support a business when they can put a face with the product. As part of your entrepreneurial endeavor make sure that you are on the scene; attend events, have a social media presence, interact with your audience. Never Give Up! Need I say more? I guarantee you if you ask any successful entrepreneur if all their business ventures/ideas were successful the answer is NO. They achieved the level of success they have now because they never gave up. They re-strategized and figured out a different approach. Be encourage and never give up your dreams. Yes, my first business venture failed but that doesn’t mean I stopped there. I learned from my mistakes and did some soul searching to understand my passion and my purpose. I’m not exactly where I want to be but I’m taking strides and enjoying the wins along the way. Hopefully, you can learn from my mistakes and we can win together. Let’s werk!